By now you know that I love all desserts with strawberries. But one of my favorites is definitely the delightful strawberry smoothie. 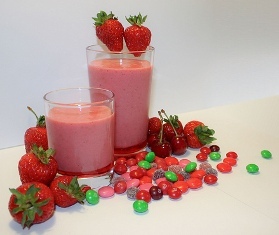 When looking around for strawberry recipes you can find the terms smoothie and shake used more or less as synonyms. Well, I DO think there is a difference. So here is my definition, that hopefully will make it easier to find YOUR favorite strawberry dessert recipe on this site. Smoothie: A yummy drink with fresh fruits, milk and ice cream. Shake: A drink with fresh fruits and milk. You want to have heavenly ice cream with your strawberry drink? Then search the strawberry smoothie recipes. Once you get all of your ingredients ready to start blending your strawberry smoothie you need the best blender for the job. Find out about the best blender on the market for healthy strawberry smoothies. And if you're an ice cream lover, you might want to have a look at the history of ice cream before going into the strawberry smoothie recipes. Chocolate, Strawberry, and Vanilla is a funny and informative book about the complete history of American ice cream.